Kyle Borley comes from the prairies of Winnipeg, Canada, and has been playing Irish traditional music on the whistle since he was 11 years old. Although Winnipeg is far from Ireland, he was highly involved in the city's vibrant Irish music community, playing in sessions teaching privately and in workshops, and performing at various venues. From 2009 to 2010 he also lived in Galway Ireland, where he lived as a street performer, going to pub sessions and gigs at night. He also plays concert flute, piccolo and bodhran. "Colin Goldie does great work, and made for me exactly the whistle I needed; in tune, loud, and a good range of back pressure. When I play concert flute, I'm very aware of how my breathing influences the rhythm and lift of a tune. I had tried using the same techniques on various whistles, but none that I tried could really hold up to the changes in air pressure I needed, without the tone breaking up. I also regularly play in loud sessions, so I needed something loud, but still with great sound. So, I ordered a whistle from Colin several years ago, and gave him those specifications. I got a whistle that does exactly what I want...can't ask for more than that! Looks great too! 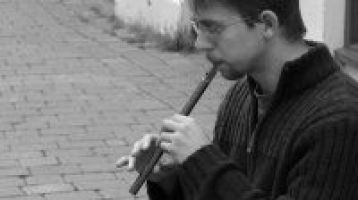 Through 2009, I lived in Galway making a living totally through busking...many, many, many hours were spent playing that whistle, and well worth it! Thanks Colin."